Today gold price in India given in Rs/10gm. Today gold price in India for 24 karat gold is 31,440 rupees per 10 grams. 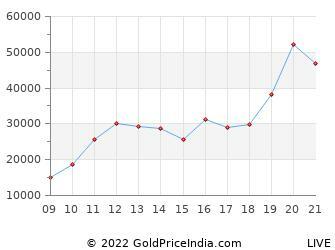 Gold price in India for 22 karat gold is 28,820 rupees per 10 grams. This calculator uses the current Gold Price Calculator price for India only. Other prices for other countries, click here or for other cities, click here. 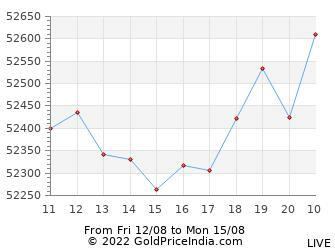 India Gold Chart showing prices over the last 12 hours excluding weekends. Today 24 karat gold price in India given in rupees per gram, 2 grams, 5 grams, 8 grams, 10 grams and 100 grams. 24 karat gold is also know as 999 gold and is the purest form of gold available in market in the form of gold coins and bars. Similarly 22 karat gold is known as 916 gold and is generally used to make jewellery. Highest gold price in India in the month of April 2019 was 32,294 rupees per 10 grams while the lowest gold price was 31,405 rupees. Gold price on 01 Apr 2019 was 31,513 rupees per 10 grams. Highest gold price in India in the month of March 2019 was 33,001 rupees per 10 grams while the lowest gold price was 31,511 rupees. Gold price on 01 Mar 2019 was 32,692 rupees per 10 grams. Gold price at the end of month was 31,703 rupees. Highest gold price in India in the month of February 2019 was 34,002 rupees per 10 grams while the lowest gold price was 32,823 rupees. Gold price on 01 Feb 2019 was 33,305 rupees per 10 grams. 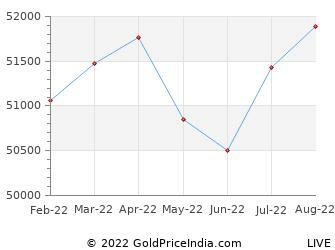 Gold price at the end of month was 32,991 rupees. 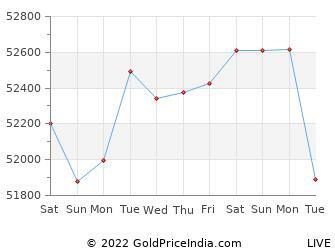 Why check gold price on GoldPriceIndia.com? GoldPriceIndia.com updates you with the latest gold price in India and from local city markets like Mumbai, Delhi, Chennai, Bangalore, Hyderabad and more such cities. We give Dubai gold price in Indian rupees and also provide you the difference between India and Dubai gold price along with gold price from other middle east countries like Saudi Arabia, Qatar, Oman, Kuwait and Bahrain. We also provide gold ETF NAV price, silver price in India, platinum price in India, historical data of gold price in India and other related information to help you investment in gold.